Aston Martin Racing overcame extremely challenging conditions throughout today’s 6 Hours of Shanghai, round 5 of the FIA World Endurance Championship Super Season, to claim a well-deserved first LMGTE victory for the new Vantage. The No.95 of Nicki Thiim and Marco Sorensen celebrated the first WEC win for the British manufacturer in the top GTE category since the 6 Hours of Mexico last year, and until the final 30 minutes it looked as though the team might even secure a 1-2 finish. Following a Safety Car period – the fifth of a race which also included two red flag stoppages for heavy rain and unsafe track conditions – the No.91 Porsche 911 RSR of Richard Lietz and Gianmaria Bruni jumped ahead of the No.97 Aston Martin (Alex Lynn/Maxime Martin) in deteriorating conditions to take second in class. The Porsche GT Team in fact came through to scoop two podium places, the No.92 Porsche of Kevin Estre and Michael Christensen passing the No.97 Aston which was on older tyres. AF Corse Ferrari’s No.51 of James Calado and Alessandro Pier Guidi came through after a difficult weekend to finish 5th in class ahead of the sister No.71 car. Ford Chip Ganassi Racing had a less successful weekend in Shanghai than in the past, while BMW was on this occasion not able to repeat its Fuji podium (on its first wet tyre run ever), both teams being awarded post race penalties for differing infringements. It was a Porsche 1-2-3 in LMGTE Am as the No.77 Dempsey Proton Racing Porsche 911 RSR of Christian Ried, Julien Andlauer and Matt Campbell claimed top honours in the 6 Hours of Shanghai today, closing out a difficult week for the German team in a positive way. The team’s No.88 of Khaled Al Qubaisi, Matteo Cairoli and WEC rookie Riccardo Pera came through for a strong third place, sandwiching Team Project 1’s Porsche with Jörg Bergmeister, Egidio Perfetti and Patrick Lindsey which took second, 8.7 seconds behind the class winner. Despite the climatic conditions over the weekend, 45,000 enthusiastic Chinese fans supported the WEC’s annual visit to Shanghai. All 20 of the GTE entries finished the race, surviving extremely difficult driving conditions to put on a great show. 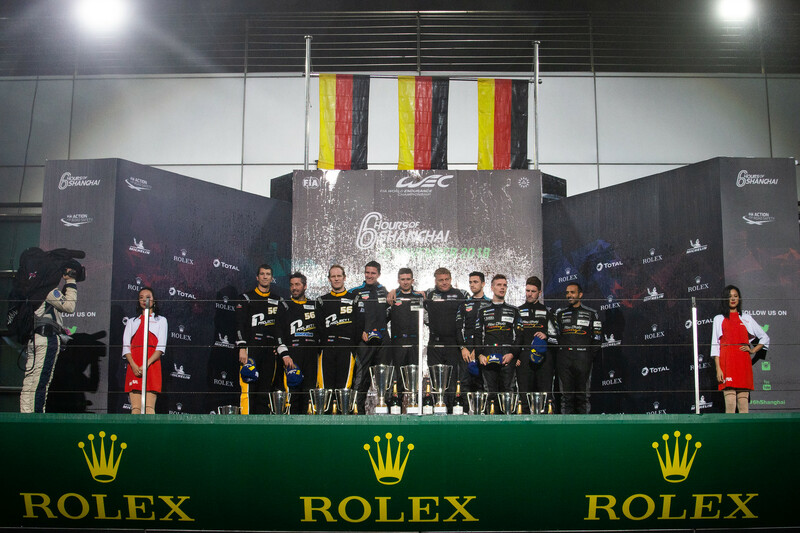 The WEC Super Season will now face a pause of a few months over the winter before resuming for the 1000 Miles of Sebring in Florida, USA on 15th March 2019 for round six.